Not All "Docs" In Marine Corps - USA Patriotism! The Fleet Marine Force (FMF) is comprised of sailors who are assigned to, or work with, Marine Corps units said Command Master Chief Christopher W. Moore, the III Marine Expeditionary Force command master chief. Though the most commonly known billets fall under health services and religious ministries, there are billets under aviation groups and squadrons, as well as infantry and logistics battalions. Most Marines are familiar with corpsmen and religious personnel, or RP’s. Some less common FMF jobs include “Seabees,” or construction support sailors or Navy divers, who work alongside reconnaissance Marines. As with any assignment there are perks to the Fleet Marine Force, one of them being the ability to qualify for the FMF warfare insignia, said Moore. “Similar to the enlisted surface or enlisted aviation warfare insignia, this device identifies sailors who have qualified as an FMF warfare expert. This means that they have demonstrated a level of proficiency through practical demonstration of skill sets critical to serving with Marines and they have demonstrated a level of professional knowledge necessary for them to integrate into their respective FMF unit,” said Moore. 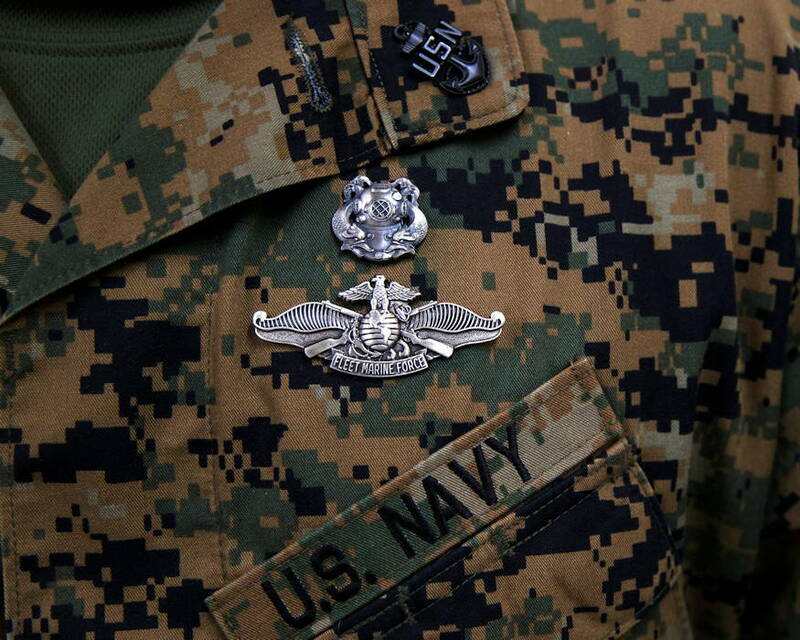 To receive the Fleet Marine Force warfare insignia, sailors must pass a test showing competency in weapons proficiency, land navigation, radio communication and Marine Corps knowledge. They also have to pass a Marine Corps Physical Fitness Test and Combat Fitness Test. Not only is serving in the FMF a valuable opportunity to sailors, but it’s also a critical component of the Marine Corps warfighting mission, said Moore. The Marine Corps would not have these billets if there was no value in having a sailor alongside to support. The sailors who encompass the FMF largely go unnoticed by Marines but without them the Marine Corps would not be able to complete the varied tasks that are part of the Marine Corps mission, said Moore. Not every sailor has the opportunity to serve in the FMF, but those that do say they gain a cherished experience.